Since the Kenya Wildlife Marathon is not only meant to be a great opportunity for trail runners to enjoy a scenic run through Kenya's breathtaking scenery but also a sound possibility for our guests to learn more about the Eastern African nation, we dedicate this blog article to some lessons about Kenya's culture. 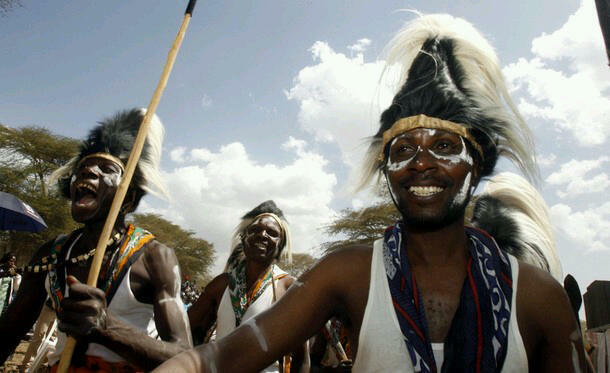 In total, one can meet around 42 different tribes in Kenya. Each of these tribes has its own unique culture, but majority of them with intertwining cultural practices brought about by the close resemblance in the languages, the similar environment and physical proximity of the tribes. Thus, one can group these tribes into different larger sub-groups which are based on linguistic as well as cultural similarities. These sub-groups of tribes are not only present in Kenya but span a vast area of East, Central and Southern African Region as a whole. In terms of ethnic diversity, Kenya is set up as follows: 22% Kikuyu, 14% Luhya, 13% Luo, 12% Kalenjin, 11% Kamba, 6% Kisii, 6% Meru, 15% other African cultures and approximately only 1% non-African [Asian, Arab and European]. Most Kenyans have been raised bilingual in Swahili and English. Swahili is a intercultural African language which evolved over numerous decades. It encompasses many Arabic, Persian and other Middle Eastern and South Asian loan words and evolved as a lingua franca for trade between the different tribes and people of Kenya. Besides, a large percentage of the Kenyans speaks the mother tongue of their ethnic tribe next to English and Swahili. So many cultures, languages, traditions, heroes and symbols! Kenya is truly diverse. Generally speaking, it can be said that there are three major unifying categories of Kenyan languages: The Cushites speaking people who are mainly composed of pastoralists and nomads in the rather dry North Eastern part of Kenya, the Bantu speaking cultures who are people of the Coastal region, the Central Highlands and the Western Kenya Region. Last but not least, there are the Nilotes who are mainly found in the Great Rift Valley and the Lake Victoria. - Believe in the 'sky god' who was once on earth and went back to the skies. From there, all the world's cattle has been sent to the Massai for safe keeping of them. - There are numerous different stories and explanations of their origins. We hope you have gained a slight insight into Kenya's cultural diversity. It is definitely important to be aware of these differences. Isn't it also spectacular how so many people from different backgrounds life in piece in one country? Kudos, Kenya!